Use this to spread the word about the importance of music education for our children. the right key at the right time and the instrument will play itself." Students will enjoy their lessons with a friendly and highly qualified teacher. 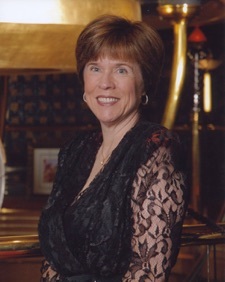 Donna Riesen is a certified teacher of music in piano, and holds a Bachelor of Music Degree in Piano Performance from the American Conservatory of Music. A native of California, Donna Riesen has taught students of all ages and levels of advancement for over forty years. Because of her memberships with several professional organizations, students are afforded the opportunity to participate in festivals and auditions at the local, state, and national levels. Those students who choose to participate usually receive the highest ratings, and are often featured in state winners recitals, which honor the top piano students across the state. While she is a serious musician and teacher, Donna Riesen believes that students of all ages and personality types learn best when they are in a happy, motivated and calm emotional state, so she always strives to provide an upbeat and positive atmosphere in the lesson. Standards are held high though, and students are expected to take their own music making seriously, even when having fun in the process of learning. • Bachelor of Music in Piano, American Conservatory of Music, Chicago, IL. • Forty years experience teaching piano privately. • Member, Music Teachers’ Association of California (MTAC). • Member, Music Teachers National Association (MTNA). • Member, National Guild of Piano Teachers, American College of Musicians. • Member, Handbell Musicians of America. • Adjudicator, Certificate of Merit (CM) evaluation program, statewide. • Adjudicator, National Guild auditions, nationwide. • Annual participation in MTAC State Conventions. • Past Branch Chairperson of Certificate of Merit. • Numerous continuing education seminars, lectures, festivals, workshops. • Directing, performing, accompanying, coaching experience.